US Navy test pilot Cmdr. 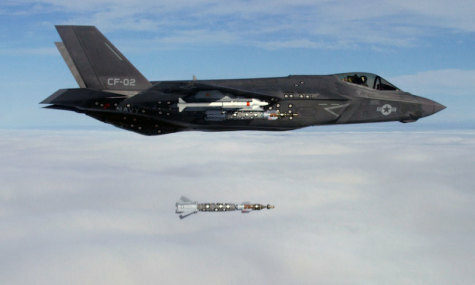 Ted Dyckman carried out the first F-35C external stores release test on 23 September 2015 over the range near NAS Patuxent River, Maryland. Four 500-pound GBU-12 Paveway II bombs were dropped during the test. This was Flight 394 for F-35C test aircraft CF-02. (EDITOR’S NOTE: It’s good to learn that, 14 years into the development program, the F-35C carrier variant has achieved this milestone.